These times it is a good thing to know where your car, bike, bicycle, boat, caravan and so on are. Not to mention the people you care about. Our GPS Tracking service provides just that. With our service the power is in your hands to track your family or friends, whether they are traveling long distances or you just need to know where they are. It works well if you have children going on a night out, just to give you peace of mind that they are where they are suppose to be. Do you have a spare phone (Android or Apple) lying around, doing nothing? Hide it in your car and you will be able to see exactly where the car is. Follow the item / person on a website, in real time. Are you tracking more than one device? See on the map exactly what device is where, by giving it a name. Record the device trace. You will exactly know what route it traveled. Device time stamps are printed on the map so you can see where and what time the device was at. If a device goes offline, you will be notified. All activity gets archived which you can export to a CSV file for offline storage. Email notifications - Is the device offline? Entering and exiting Geo-fence areas, and more. Speaking about Geo-Fences - You have the ability to create geo-fenced areas. You can upload a photo of the device you are tracking. Photo's can be a face of the teenager you are tracking, and so on. If you are tracking a vehicle, this service tracks the distance traveled and can notify you if scheduled maintenance needs to be carried out after a predefined distance was traveled. 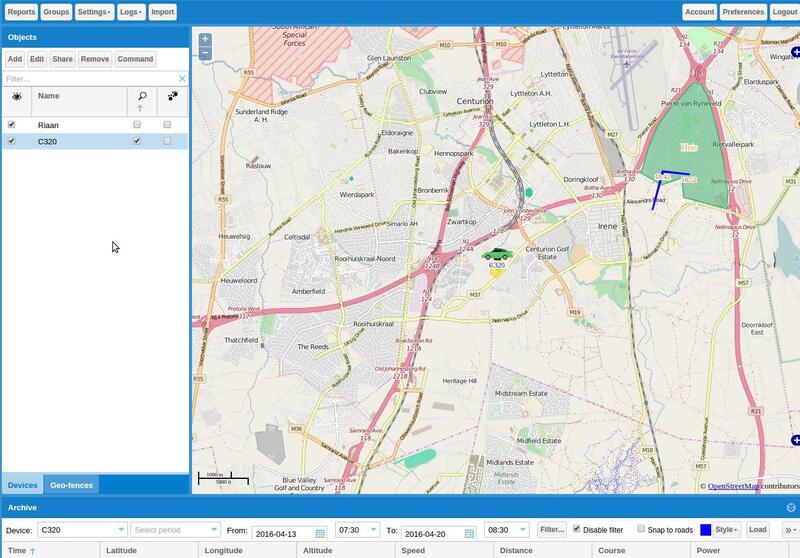 You can generate reports containing general information, drives and stops, distance detail, over speeds, Geo-fence in and outs. You can create device groups. You can specify device filters. If you buy this item, please do not pay immediately. We are giving you a FREE trial period of 7 days in which you can test the service and see if it will work for you. After the trial period, you can decide if you want to continue the service or not. If you do not want to continue, that is it, no questions asked. No fee will be needed. If you want to continue, a monthly fee of R 50 will apply. This is a month-to-month contract. You can cancel at any time. The 7 day trial period will enable you to track 1 device (Android or Apple). If you continue, you will be able to track 2 devices for R 50 per month. Additional devices will be charged at R 20 per device. After checkout we will send you a message with the tracking website URL (We cannot provide it here as we may not advertise) and steps to get you started.